Moyle Rovers claimed their eighth Tipperary SFC championship in comfortable fashion with a 1-15 to 1-07 win over Ardfinnan at Semple Stadium in Thurles this evening. The first half told a different story though, as Ardfinnan looked to be on for a fairytale ending to their outstanding season - they went in at the break 0-06 to 0-05 to the good after having the lion’s share of proceedings in the opening half. But a second half blitz from Rovers quickly shattered Ardfinnan hopes as the Blues were simply on another level, with Liam Boland and Shane Foley leading the attack to outscore their counterparts 1-10 to 1-01 in the second period. Ardfinnan seemed to completely collapse in the second half and would have felt they were in a good position – leading 0-06 to 0-02 with just a few minutes left before the break. They will have felt aggrieved not to be awarded a penalty before the end of the half when Daniel O’Regan appeared to be pulled down, but two Boland frees and a Foley score from play set the tone for what was to come after the change of ends. It was all one-way traffic on the resumption as Moyle began to exploit the Ardfinnan defensive system that had worked so well all year, but looked jaded as Boland, Foley and Mulcahy all pointed from play in the first ten minutes of the half. It was a tide Ardfinnan couldn’t stem, as the blue waves of attack looked to completely drain them and Moyle Rovers continued to take full advantage. Further scores from Boland, Stephen Quirke and an excellent Richard Power score set Moyle on their way with ten minutes remaining. 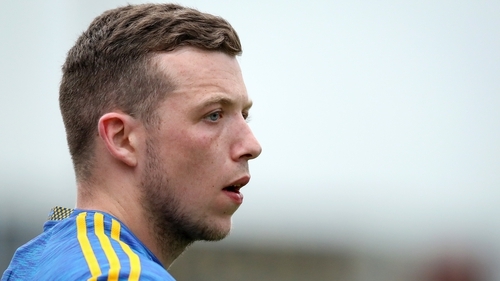 Ardfinnan looked for goals to get back into it late on and they had a glimmer of hope when substitute Paul Kennedy latched onto a long ball to finish well to the net in the 58th minute. But Moyle finished the game from the resulting kick out, going straight down the field to net through the left boot of Foley and that was enough for Moyle to see out the win. Moyle Rovers: Ciaran Kenrick; Paddy Morrissey, Alan Campbell, Morgan Irwin; David McGrath, Ross Mulcahy (0-01), Luke Boland; Richard Power (0-01), Peter Acheson; Dara Ryan, Stephen Quirke (0-01), Sean Carey (0-01f); Liam Boland (0-06 0-04f), Shane Foley (1-02), Danny Owens (0-01). Subs: Aidan McGrath for Sean Carey (37); Tadhg Fitzgerald for Luke Boland (45); Diarmuid Foley (0-02) for Stephen Quirke (47); Riain Quigley for Danny Owens (57); Jack Harney for Shane Foley (60); Darragh Dwyer for Alan Campbell (62). Ardfinnan: Michael Goonan; Eoin Walsh, Jonathan Ryan, Michael O’Sullivan; Darragh O’Leary, Colm O’Shaughnessy (0-01), Gavin Whelan; Gerry Cronin, Sean Nagle (0-01); Billy Hewitt (0-01f), Dylan Nugent, Aaron Lonergan, Michael Barlow (0-02, 0-01f), Daniel O’Regan (0-01), Colin O’Gorman (0-01). Subs: Paul Kennedy (1-00) for Michael Barlow (47); Jason Coffey for Dylan Nugent (49); Adam Savage for Daniel O’Regan (55); James O’Mahoney for Aaron Lonergan (59).